Fish implanted with acoustic transmitters are assumed to behave and grow after stocking similar to untagged fish. In this study, three groups (tagged, sham, and control) of rainbow trout Oncorhynchus mykiss [mean (SD) initial length = 277 (24) mm] range were maintained together in three raceways for 90 days, with each raceway containing 10 tagged, 10 sham, and 10 control fish. The fish in the tagged group were anesthetized and had an inert transmitter inserted via a ventral incision. Fish in the sham group were anesthetized and had an incision without transmitter implantation, while the control group was anesthetized only. In each raceway, trout with the inert transmitters were significantly lighter and shorter than fish from the other two groups at the end of the experiment. However, the reduction in weight, length, and specific growth rate occurred primarily during the first 38 days post-tagging, with tagged fish growing at similar rates to the other two groups for the final 52 days of the experiment. Mortality data indicated a survival threshold of 280 mm length in the tagged fish, with 100% survival of the Rainbow Trout greater than 280 mm and only 59.1% survival of trout less than 280 mm. Based on the results of this study, rainbow trout implanted with 9 x 24 mm, 3.6 g acoustic transmitters should be held prior to release for a minimum of 38 days to ensure similar growth rates as untagged conspecifics, and only trout with an initial length greater than 280 mm should be used to maximize survival. Keywords: Acoustic transmitter, Anesthesia, Hatchery rearing, Internal tags, Oncorhynchus mykiss, Rainbow trout, Specific growth rate, Surgery. © Urbaniak et al. ; Licensee Bentham Open. Acoustic telemetry is widely used to determine fish movement and survival [1Ammann AJ, Michel CJ, MacFarlane RB. The effects of surgically implanted acoustic transmitters on laboratory growth, survival and tag retention in hatchery yearling Chinook salmon. Environ Biol Fishes 2013; 96: 135-43. [http://dx.doi.org/10.1007/s10641-011-9941-9] ]. Acoustic transmitters are surgically-implanted into the fish, with the assumption that the movement, behavior, and survival of the tagged fish are unaffected [2Anglea SM, Geist DR, Brown RS, Deters KA, McDonald RD. Effects of acoustic transmitters on swimming performance and predator avoidance of juvenile Chinook salmon. N Am J Fish Manage 2004; 24: 162-70. [http://dx.doi.org/10.1577/M03-065] , 3Panther JL, Brown RS, Gaulke GL, Deters KA, Woodley CM, Eppard MB. Influence of incision location on transmitter loss, healing, survival, growth, and suture retention of juvenile Chinook salmon. Trans Am Fish Soc 2011; 140: 1492-503. [http://dx.doi.org/10.1080/00028487.2011.637003] ]. In order to produce valid data, it is essential that acoustic tags and the surgery required to implant them have negligible impacts, so that the behavior and fate of tagged fish is similar to untagged conspecifics [4Cooke SJ, Woodley CM, Eppard MB, Brown RS, Nielsen JL. Advancing the surgical implantation of electronic tags in fish: a gap analysis and research agenda based on a review of trends in intracoelomic tagging effects studies. Rev Fish Biol Fish 2011; 21: 127-51. The results from other studies examining the impacts of acoustic tags on implanted fish are inconsistent. Acoustic tag implantation in juvenile Chinook salmon Oncorhynchus tshawytscha has been shown in some studies to have no deleterious effects on predator avoidance or swimming performance, and no negative effects on long-term growth [1Ammann AJ, Michel CJ, MacFarlane RB. The effects of surgically implanted acoustic transmitters on laboratory growth, survival and tag retention in hatchery yearling Chinook salmon. Environ Biol Fishes 2013; 96: 135-43. [http://dx.doi.org/10.1007/s10641-011-9941-9] , 2Anglea SM, Geist DR, Brown RS, Deters KA, McDonald RD. Effects of acoustic transmitters on swimming performance and predator avoidance of juvenile Chinook salmon. N Am J Fish Manage 2004; 24: 162-70. [http://dx.doi.org/10.1577/M03-065] , 5Adams NH, Rondorf DW, Evans SD, Kelly JE. Effects of surgically and gastrically implanted radio transmitters on growth and feeding behavior of juvenile Chinook salmon. Trans Am Fish Soc 1998; 127: 128-36. [http://dx.doi.org/10.1577/1548-8659(1998)127<0128:EOSAGI>2.0.CO;2] ]. Similarly, no negative effects of acoustic transmitter implantation on the growth sockeye salmon Oncorhynchus nerka have been observed [6Brown RS, Geist DR, Deters KA, Grassell A. Effects of surgically implanted acoustic transmitters >2% of body mass on the swimming performance, survival and growth of juvenile sockeye and Chinook salmon. J Fish Biol 2006; 69: 1626-38. [http://dx.doi.org/10.1111/j.1095-8649.2006.01227.x] ]. Atlantic salmon Salmo salar that were implanted with acoustic transmitters, underwent surgery with no transmitter insertion (sham-tagged), or served as controls also showed no significant differences in growth [7Moore A, Russell IC, Potter EC. The effects of intraperitoneally implanted dummy acoustic transmitters on the behavior and physiology of juvenile Atlantic salmon, Salmo salar. L. J Fish Biol 1990; 37: 713-21. In contrast, other studies have found that acoustic transmitters decrease the growth rate of implanted fish. The growth of juvenile Atlantic salmon tagged with dummy acoustic transmitters has been reported to initially lag that of control and sham-tagged fish [8Robertson MJ, Scruton DA, Brown JA. Effects of surgically implanted transmitters on swimming performance, food consumption and growth of wild Atlantic salmon parr. J Fish Biol 2003; 62: 673-8. [http://dx.doi.org/10.1046/j.1095-8649.2003.00055.x] , 9Lacroix GL, Knox D, McCurdy P. Effects of implanted dummy acoustic transmitters on juvenile Atlantic salmon. Trans Am Fish Soc 2004; 133: 211-20. [http://dx.doi.org/10.1577/T03-071] ], although in one study, tagged salmon eventually grew at the same rate as the other two groups [9Lacroix GL, Knox D, McCurdy P. Effects of implanted dummy acoustic transmitters on juvenile Atlantic salmon. Trans Am Fish Soc 2004; 133: 211-20. There is a paucity of research examining the effects on growth and survival of rainbow trout after the implantation of acoustic transmitters. There is also a lack of research examining the growth and survival of acoustic-tagged fish when placed into an environment with untagged conspecifics, instead of having tagged and untagged fish placed into distinct rearing units. Thus, the objective of this study was to evaluate the growth and survival of acoustic tagged rainbow trout in a competitive environment, where tagged fish compete for food with untagged fish. Experimentation occurred at McNenny State Fish Hatchery, rural Spearfish, South Dakota, USA. Well water (11̊ C; total hardness as CaCO3, 360 mg/L; alkalinity as CaCO3, 210 mg/L; pH, 7.6; total dissolved solids, 390mg/L) was used throughout the study. Ninety Shasta-strain rainbow trout [mean (SD) initial length and weight = 277 (24) mm and 208 (60) g respectively] were assigned to one of three treatments, with 30 randomly-selected fish receiving each treatment. Tagged fish were anesthetized and received an inert acoustic transmitter. Sham fish were anesthetized, received an incision, but did not have a transmitter implanted. Control fish were anesthetized only. The 90 fish were divided into subsets of 30 fish each (10 tagged, 10 sham, and 10 control fish), with each subset placed into one of three hatchery raceways (4.7 m long x 2.4 m wide x 0.5 m deep). Rearing densities were extremely low and never even approached critical density index values [10Piper RG, McElwain IB, Orme LE, McCraren JP, Fowler LG, Leonard JR. Fish hatchery management. US Fish Wildlife Service 1982.]. Dissolved oxygen in all of the units was maintained at or above 8.0 mg/L. Prior to surgery, fish were anesthetized using tricaine methanosulfate (MS-222; Argent Chemical Laboratories, Ferndale, Washington, USA), to stage 4 anesthesia [11Hikasa Y, Takase K, Ogasawara T, Ogasawara S. Anesthesia and recovery with tricaine methanesulfonate, eugenol and thiopental sodium in the carp, Cyprinus carpio. Nippon Juigaku Zasshi 1986; 48(2): 341-51. [http://dx.doi.org/10.1292/jvms1939.48.341] [PMID: 3712895] ]. After anesthesia, fish were measured to the nearest mm (total length), weighed to the nearest g, and tagged with a unique alphanumeric-coded visible implant (VI) tag (1.2 mm x 2.7 mm; Northwest Marine Technology, Inc., Seattle, Washington, USA) inserted in postorbital tissue to identify each trout throughout the duration of the study. After insertion of the VI tag, the trout in the tagged or sham groups were placed ventral side up in a grooved container. A 10 mm incision was made 3 mm from the midventral line, anterior to either of the pelvic fins. In the tagged group, an inert transmitter (9 x 24 mm, 3.6 g weight in air; VEMCO, Bedford, Nova Scotia, Canada) was inserted into the peritoneal cavity. Sham fish were anesthetized and incised, but no tag was inserted. Control fish only experienced anesthesia and handling. Incisions were closed using two simple uninterrupted sutures (Oasis Nylon Monofilament sutures 4-0, Glendora, California, USA). Statistical analysis was performed using the statistical programs R version 2.15.1 (R Development Core Team 2012) and SYSTAT 13 statistical software (SYSTAT, Evanston, Illinois USA). Logistical regression was used to compare initial weights and percent tag weight between surviving fish and mortalities using a max likelihood coefficient of determination (r2-maxL). Surviving fish for the study duration were labeled with a 0 while mortalities were given a 1. Logistical regression was also used to compare initial length to survival of the tagged treatment group. The effect of initial length on survival was evaluated using a Kolmogorov-Smirnov two sample test in an attempt to discern a minimum initial fish length for successful transmitter insertion. Two-way analysis of variance (ANOVA) was used, with tagging treatment and raceway as fixed factors. If a significant difference (P< 0.05) was observed, Tukey’s mean comparison procedure was conducted to determine differences among the means. Twenty-two fish died during this study, with the majority of mortality (15 fish) occurring within the first week after tagging. Overall, four control fish, six sham fish, and twelve tagged fish died. 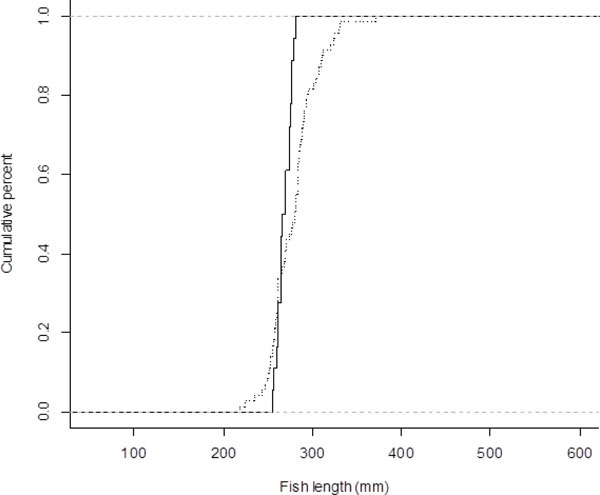 Survival of fish used in this study was significantly affected by initial total length (P=.006, r2-maxL= 0.17) as fish that survived had a significantly larger distribution than fish that died (Kolmogorov-Smirnov test; D= 0.479, P=0.003; Fig. 1 ). Tagged individuals with an initial length greater than 280 mm all survived the duration of the study. However, tagged fish with an initial length of less than 280 mm had a survival rate of 59%. There was no significant effect of tag weight, as a percentage of initial fish weight, on tagged fish survival. There was also no significant effect of initial weight on fish survival as well. Eight tagged fish expelled their hydro acoustic tag during the study period. All eight of these fish survived to the end of the experiment. Kolmogorov-Smirnov test comparing length to survival. The solid line shows fish that were labeled as mortalities while the dotted line shows fish that survived the duration of the study. This test was significant (P < 0.05, n = 73). Of the fish that survived over the 90 days of the study, significantly reduced growth was observed in the tagged fish in comparison to the control and sham fish. Weight gain (F8,2,2,4, P = 0.011), percent weight gain (F8,2,2,4, P < 0.001), length increase (F8,2,2,4, P = 0.001), percent length increase (F8,2,2,4, P = 0.001), and SGR (F8,2,2,4, P < 0.001) were all significantly lower in the tagged fish Table 1. There were no significant differences in any of the condition indices at the end of the experiment, except for a marginal significant increase in SSI in the tagged group (F8,2,2,4, P = 0.016). When determined by each sampling period, specific growth rates were only significantly lower (F8,2,2,4, P < 0.001) in the tagged fish after the first 37 days (Table 2). There were no significant differences among the treatments in SGR in the 38 to 65 day period or from days 66 to 90. Mean (SE) growth and condition values for Rainbow Trout that survived for 90 days after undergoing one of three treatments: anesthesia (handled, N= 26), anesthesia and sham surgery (sham, N = 24), and anesthesia and implantation of an inert acoustic transmitter (tagged, N = 18). For each variable, values within a row with different letters are significantly different (P < 0.05). Mean (SE) specific growth rate (SGR)a for Rainbow Trout during three time intervals over 90 days after undergoing one of three treatments: anesthesia (handled, N= 26), anesthesia and sham surgery (sham, N = 24), and anesthesia and implantation of an inert acoustic transmitter (tagged, N = 18). For each variable, values within a row with different letters are significantly different (P < 0.05). Weight gain (F8,2,2,4, P = 0.008), percent weight gain (F8,2,2,4, P = 0.007), length increase (F8,2,2,4, P = 0.006), percent length increase (F8,2,2,4, P = 0.014) and SGR (F8,2,2,4, P = 0.002) were significantly different among the three raceways (Table 3). However, the pattern was consistent in each raceway, with tagged fish experiencing decreased growth initially compared to the other two treatments. Mean (SE) increases of overall weight, percentage increase from initial to final weight, total length from initial measurements to final measurements, and specific growth rate (SGR)a for Rainbow Trout held in three separate raceways (A, B, C). Mortality is the total number of individuals that died per raceway. For each variable, values within a row with different letters are significantly different (P < 0.05). It is apparent that the rainbow trout in this study were affected by the surgical insertion of acoustic transmitters. The initial lag in growth from rainbow trout implanted with transmitters is similar to those reported with other salmonid species [9Lacroix GL, Knox D, McCurdy P. Effects of implanted dummy acoustic transmitters on juvenile Atlantic salmon. Trans Am Fish Soc 2004; 133: 211-20. [http://dx.doi.org/10.1577/T03-071] ]. Decreased growth in tagged Atlantic salmon, compared to controls, ranged from 9 to 36 days post-tagging [8Robertson MJ, Scruton DA, Brown JA. Effects of surgically implanted transmitters on swimming performance, food consumption and growth of wild Atlantic salmon parr. J Fish Biol 2003; 62: 673-8. [http://dx.doi.org/10.1046/j.1095-8649.2003.00055.x] ]. Similarly, the growth rates of juvenile Chinook salmon with surgically implanted radio tags were reported to be slightly impaired in the first three weeks after surgery, but growth was comparable after eight weeks to those of control fish [5Adams NH, Rondorf DW, Evans SD, Kelly JE. Effects of surgically and gastrically implanted radio transmitters on growth and feeding behavior of juvenile Chinook salmon. Trans Am Fish Soc 1998; 127: 128-36. [http://dx.doi.org/10.1577/1548-8659(1998)127<0128:EOSAGI>2.0.CO;2] ]. In contrast, other studies report that the growth of fish after receiving acoustic transmitters is not significantly different than that of control or sham fish, but there are differences in the methodology used in those studies compared to the current experiment. In studies with Chinook or sockeye salmon, no differences in fork length or mass were observed among fish that were implanted with acoustic transmitters, underwent surgery with no transmitter insertion (sham-tagged), or served as controls [6Brown RS, Geist DR, Deters KA, Grassell A. Effects of surgically implanted acoustic transmitters >2% of body mass on the swimming performance, survival and growth of juvenile sockeye and Chinook salmon. J Fish Biol 2006; 69: 1626-38. [http://dx.doi.org/10.1111/j.1095-8649.2006.01227.x] ]. However, those fish that were much smaller than those used in this study, and growth was only evaluated 21 days post-tagging [6Brown RS, Geist DR, Deters KA, Grassell A. Effects of surgically implanted acoustic transmitters >2% of body mass on the swimming performance, survival and growth of juvenile sockeye and Chinook salmon. J Fish Biol 2006; 69: 1626-38. [http://dx.doi.org/10.1111/j.1095-8649.2006.01227.x] ]. In another study with Chinook salmon, no differences in growth between acoustic-tagged Chinook salmon and a sham group were observed, but sampling at the end of 160 days may have masked any early reductions in growth [1Ammann AJ, Michel CJ, MacFarlane RB. The effects of surgically implanted acoustic transmitters on laboratory growth, survival and tag retention in hatchery yearling Chinook salmon. Environ Biol Fishes 2013; 96: 135-43. Based on the results of this study, it is essential that rainbow trout implanted with acoustic transmitters be allowed to sufficiently recover from the surgery and adapt to the inserted transmitters so that they can accurately represent the movement, behavior, and survival of the untagged fish [2Anglea SM, Geist DR, Brown RS, Deters KA, McDonald RD. Effects of acoustic transmitters on swimming performance and predator avoidance of juvenile Chinook salmon. N Am J Fish Manage 2004; 24: 162-70. [http://dx.doi.org/10.1577/M03-065] -4Cooke SJ, Woodley CM, Eppard MB, Brown RS, Nielsen JL. Advancing the surgical implantation of electronic tags in fish: a gap analysis and research agenda based on a review of trends in intracoelomic tagging effects studies. Rev Fish Biol Fish 2011; 21: 127-51. [http://dx.doi.org/10.1007/s11160-010-9193-3] ]. A minimum of 38 days post-tagging is necessary for the implanted fish to grow similarly to untagged conspecifics. The subsequent recovery in growth of the tagged fish after 38 days indicates that at least for the length of this study, there were no longer-term ill effects of tag residence within the body cavity. While there is no data to conclusively say if these results are applicable to other internal tag types, we suspect that the placement of any foreign object, such as radio tags, within the body cavity would likely elicit a similar response. The 40% mortality in tagged fish in this study was double the previously reported in tagged age-one Chinook salmon [1Ammann AJ, Michel CJ, MacFarlane RB. The effects of surgically implanted acoustic transmitters on laboratory growth, survival and tag retention in hatchery yearling Chinook salmon. Environ Biol Fishes 2013; 96: 135-43. [http://dx.doi.org/10.1007/s10641-011-9941-9] ]. This high mortality in the tagged fish is likely due to a combination of factors. Success of acoustic transmitter implantation may be dependent on the skill of the surgeon [12Deters KA, Brown RS, Carter KM, Boyd JW, Eppard MB, Seaburg AG. Performance assessment of suture type, water temperature, and surgeon skill in juvenile Chinook salmon surgically implanted with acoustic transmitters. Trans Am Fish Soc 2010; 139: 888-99. [http://dx.doi.org/10.1577/T09-043.1] ]. The individual performing the surgery for this study was relatively inexperienced and had not received significant feedback, which can be extremely beneficial [12Deters KA, Brown RS, Carter KM, Boyd JW, Eppard MB, Seaburg AG. Performance assessment of suture type, water temperature, and surgeon skill in juvenile Chinook salmon surgically implanted with acoustic transmitters. Trans Am Fish Soc 2010; 139: 888-99. [http://dx.doi.org/10.1577/T09-043.1] ]. In addition, the elevated mortality of trout in all three of the treatments may indicate issues with the condition of the rainbow trout [6Brown RS, Geist DR, Deters KA, Grassell A. Effects of surgically implanted acoustic transmitters >2% of body mass on the swimming performance, survival and growth of juvenile sockeye and Chinook salmon. J Fish Biol 2006; 69: 1626-38. [http://dx.doi.org/10.1111/j.1095-8649.2006.01227.x] ]. The timing of mortality within the first week after surgery observed in this study follows a previous pattern of acoustic tag post-implantation mortality [9Lacroix GL, Knox D, McCurdy P. Effects of implanted dummy acoustic transmitters on juvenile Atlantic salmon. Trans Am Fish Soc 2004; 133: 211-20. Similar to this study, other authors have identified thresholds in fish size for the survival of salmonids implanted with acoustic tags. Our study found that fish were not limited to the “2% rule” of tag weight to body weight ratio [13Winter J. Fisheries techniques. 2nd ed. American Fisheries Society 1996; pp. 555-90.]. Other authors have determined various thresholds that are not only tag type dependent, but also species dependent. An apparent minimum tag to body weight ratio for juvenile Chinook salmon implanted with acoustic transmitters has also been observed, with fish with a ratio of greater than 8.2% negatively affected by tag implantation [14Brown RS, Harnish RA, Carter KM, Boyd JW, Deters KA, Eppard MB. An evaluation of the maximum tag burden for implantation of acoustic transmitters in juvenile Chinook salmon. N Am J Fish Manage 2010; 30: 499-505. [http://dx.doi.org/10.1577/M09-038.1] ]. A threshold of 5.8% transmitter-to-body-weight ratio in juvenile Chinook salmon has also been reported, with 100% mortality occurring above this threshold for ultrasonic transmitters [15Hall JE, Chamberlin J, Kagley AN, Greene C, Fresh KL. Effects of gastric and surgical insertions of dummy ultrasonic transmitters on juvenile Chinook salmon in seawater. Trans Am Fish Soc 2009; 138: 52-7. [http://dx.doi.org/10.1577/T07-267.1] ]. With 1-year old Chinook salmon, a 5.6% transmitter-to-body-weight ratio was previously reported as appropriate [1Ammann AJ, Michel CJ, MacFarlane RB. The effects of surgically implanted acoustic transmitters on laboratory growth, survival and tag retention in hatchery yearling Chinook salmon. Environ Biol Fishes 2013; 96: 135-43. [http://dx.doi.org/10.1007/s10641-011-9941-9] ], with a 7 to 8% body weight ratio in coho salmon inserted with three different sizes of hydro acoustic transmitters also recommended [16Chittenden CM, Butterworth KG, Cubitt KF, et al. Maximum tag to body size ratios for an endangered coho salmon (O. kisutch) stock based on physiology and performance. Environ Biol Fishes 2009; 84: 129-40. [http://dx.doi.org/10.1007/s10641-008-9396-9] ]. Because of differences in suggested body-weight-to-tag-weight ratios, telemetry studies should be validated by laboratory trials prior to field application. The least burdensome transmitter that can satisfy the needs of the study should be used [1Ammann AJ, Michel CJ, MacFarlane RB. The effects of surgically implanted acoustic transmitters on laboratory growth, survival and tag retention in hatchery yearling Chinook salmon. Environ Biol Fishes 2013; 96: 135-43. Acoustic transmitters should be retained long enough for data collection [3Panther JL, Brown RS, Gaulke GL, Deters KA, Woodley CM, Eppard MB. Influence of incision location on transmitter loss, healing, survival, growth, and suture retention of juvenile Chinook salmon. Trans Am Fish Soc 2011; 140: 1492-503. [http://dx.doi.org/10.1080/00028487.2011.637003] ]. Although several of the trout in this study expelled their inert transmitters relatively soon after surgery, retention time was at least 90 days for most of the tagged fish. Tag shedding may occur because of the expulsion of the tag through the incision [17Jepsen N, Koed A, Thorstad EB, Baras E. Surgical implantation of telemetry trasnmitters in fish: how much have we learned? Hydrobiologia 2002; 483: 239-48. [http://dx.doi.org/10.1023/A:1021356302311] , 18Knight BC, Lasee BA. Effects of implanted transmitters on adult bluegills at two temperatures. Trans Am Fish Soc 1996; 125: 440-9. [http://dx.doi.org/10.1577/1548-8659(1996)125<0440:EOITOA>2.3.CO;2] ], expulsion of the tag through the body wall [17Jepsen N, Koed A, Thorstad EB, Baras E. Surgical implantation of telemetry trasnmitters in fish: how much have we learned? Hydrobiologia 2002; 483: 239-48. [http://dx.doi.org/10.1023/A:1021356302311] , 19Welch DW, Batten SD, Ward BR. Growth, survival, and tag retention of steelhead trout (O. mykiss) surgically implanted with dummy acoustic tags. Hydrobiologia 2007; 582: 289-99. [http://dx.doi.org/10.1007/s10750-006-0553-x] ], or loss through the intestine [17Jepsen N, Koed A, Thorstad EB, Baras E. Surgical implantation of telemetry trasnmitters in fish: how much have we learned? Hydrobiologia 2002; 483: 239-48. [http://dx.doi.org/10.1023/A:1021356302311] , 20Chisholm IM, Hubert WA. Expulsion of dummy transmitters by rainbow trout. Trans Am Fish Soc 1985; 114: 766-7. [http://dx.doi.org/10.1577/1548-8659(1985)114<766:EODTBR>2.0.CO;2] ]. Because we sampled fish in 30 d increments, we were able to observe individuals regularly and believe that the majority of fish that expelled their tags in our study passed them through the body wall based on tag bulge and inflammation. One other study concluded that tag loss occurring before 31 d was likely occurring at the incision site and all tag shedding after was attributed to being passed through the body wall [21Sandstrom PT, Ammann AJ, Michel C, et al. Growth, survival, and tag retention of steelhead trout (Oncorhynchus mykiss) and its application to survival estimates. Environ Biol Fishes 2013; 96: 145-64. [http://dx.doi.org/10.1007/s10641-012-0051-0] ]. The size of fish may play a role in transmitter retention [1Ammann AJ, Michel CJ, MacFarlane RB. The effects of surgically implanted acoustic transmitters on laboratory growth, survival and tag retention in hatchery yearling Chinook salmon. Environ Biol Fishes 2013; 96: 135-43. [http://dx.doi.org/10.1007/s10641-011-9941-9] ], and other factors, such as suture types and surgeon skill, also influence tag retention [1Ammann AJ, Michel CJ, MacFarlane RB. The effects of surgically implanted acoustic transmitters on laboratory growth, survival and tag retention in hatchery yearling Chinook salmon. Environ Biol Fishes 2013; 96: 135-43. [http://dx.doi.org/10.1007/s10641-011-9941-9] , 12Deters KA, Brown RS, Carter KM, Boyd JW, Eppard MB, Seaburg AG. Performance assessment of suture type, water temperature, and surgeon skill in juvenile Chinook salmon surgically implanted with acoustic transmitters. Trans Am Fish Soc 2010; 139: 888-99. [http://dx.doi.org/10.1577/T09-043.1] ]. The relatively low water temperatures of 11°C used in this study should have aided tag retention [1Ammann AJ, Michel CJ, MacFarlane RB. The effects of surgically implanted acoustic transmitters on laboratory growth, survival and tag retention in hatchery yearling Chinook salmon. Environ Biol Fishes 2013; 96: 135-43. The splenosomatic index is an indirect measurement of immune function in fish [22Wiens GD, Marancik DP, Zwollo P, Kaattari SL. Reduction of rainbow trout spleen size by splenectomy does not alter resistance against bacterial cold water disease. Dev Comp Immunol 2015; 49(1): 31-7. [http://dx.doi.org/10.1016/j.dci.2014.11.003] [PMID: 25445908] ], and dramatically increases in stressed or diseased Rainbow Trout [23Hisar O, Yanki T, Hisar SA. Clinical and pathological investigation of Psychrobacter immobilis infection in rainbow trout (Oncorhynchus mykiss, Walbaum). Israeli J Aquac - Bamidgeh 2002; 54: 189-96.]. The splenosomatic values observed in this study were all slightly higher than those reported for rainbow trout in a number of other studies [24Shimma Y, Shimnia H, Ikedo K. Plasma constiuents of 2-year-old rainbow trout raised with fish meal and SCP combined feeds. Bull Natl Res Inst Aquacult 1982; 3: 61-73.-27Parker TM, Barnes ME. Effects of different water velocities on the hatchery rearing performance and recovery from transportation of Rainbow Trout fed two different rations. Trans Am Fish Soc 2015; 144: 882-90. [http://dx.doi.org/10.1080/00028487.2015.1047533] ], but were very similar to those observed in one other study [28Sharifuzzaman SM, Al-Harbi AH, Austin B. Characteristics of growth, digestive system functionality, and stress factors of rainbow trout fed probiotics Kocuria SM1 and Rhodococcus SM2. Aquaculture 2014; 418-419: 55-61. [http://dx.doi.org/10.1016/j.aquaculture.2013.10.006] , 29Barnes ME, Brown ML, Bruce TJ, Neiger R, Sindelar S. Effects of a fermented soybean meal diet on rainbow trout mortality and immune function during a disease outbreak. J Aquacult Feed Sci Nutr 2015; 7: 6-15. ], and well within normal values [30Wiens GD, Vallejo RL, Leeds TD, et al. Assessment of genetic correlation between bacterial cold water disease resistance and spleen index in a domesticated population of rainbow trout: identification of QTL on chromosome Omy19. PLoS One 2013; 8(10): e75749. [http://dx.doi.org/10.1371/journal.pone.0075749] [PMID: 24130739] ]. Thus, the small, but significant difference, in splenosomatic index among the treatments was likely not biologically significant. The similar HSI and VSI values among the treatments at the end of the study indicate that the tagged fish, although smaller than the untagged fish, were still partitioning nutrients in the same manner. Both VSI and HSI are indicators of lipid deposition [31Oguri M. On the liver tissue of freshwater stingrays and balloonfish. Bull Jpn Soc Sci Fish 1985; 51: 717-20. 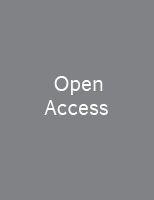 [http://dx.doi.org/10.2331/suisan.51.717] -34Yildiz M. The study of fillet quality and growth performance of Rainbow Trout (Oncorhynchus mykiss) fed with diets containing different amounts of vitamin E. Turkish J Fish Aquatic Sci 2004; 4: 81-6. ], and HSI is particularly reflective of nutritional status [35Hung SS, Groff JM, Lutes PB, Finn-Aikens FK. Hepatic and intestinal histology of juvenile white sturgeon fed different carbohydrates. Aquaculture 1990; 87: 349-60. [http://dx.doi.org/10.1016/0044-8486(90)90072-U] ]. Similar HSI values among the treatments may also suggest similar physiological stress levels [36Sloof W, Van Kreijl C, Baars A. Relative liver weights and xenobiotic-metabolizing enzymes of fish from polluted surface waters in the Netherlands. Aquat Toxicol 1983; 4: 1-14. [http://dx.doi.org/10.1016/0166-445X(83)90057-7] ] at the end of the study. Why the fish, regardless of treatment, had a slower growth rate in one of the raceways is unknown. It is possible that there was a positional effect, because the slower growth raceway was the only one that bordered a hatchery road. However, all of the raceways were completely covered, which should have limited any exposure to disturbances. In addition, no positional effects have ever been observed in prior studies or during hatchery production. It is more likely that the difference was due to possible differences in how the fish were handled initially. The slower growth raceway fish were the first to undergo anesthesia or surgery, and fish placed in subsequent raceways may have benefitted from the experience gained by the tagging crew [11Hikasa Y, Takase K, Ogasawara T, Ogasawara S. Anesthesia and recovery with tricaine methanesulfonate, eugenol and thiopental sodium in the carp, Cyprinus carpio. Nippon Juigaku Zasshi 1986; 48(2): 341-51. [http://dx.doi.org/10.1292/jvms1939.48.341] [PMID: 3712895] ]. More importantly, the lack of an adequate explanation for the raceway differences in growth does not impact the differences in growth among the treatments, because the treatment results were consistent among all three raceways. Rainbow trout inserted with acoustic transmitters should be held for a minimum of 38 days to ensure that their subsequent behavior and fate is similar to untagged conspecifics [4Cooke SJ, Woodley CM, Eppard MB, Brown RS, Nielsen JL. Advancing the surgical implantation of electronic tags in fish: a gap analysis and research agenda based on a review of trends in intracoelomic tagging effects studies. Rev Fish Biol Fish 2011; 21: 127-51. [http://dx.doi.org/10.1007/s11160-010-9193-3] ]. A minimum total length of 280 mm is also required to maximize Rainbow Trout survival when implanted with the 3.6 g, 9 x 24 mm, transmitters. We thank Greg Simpson, Patrick Nero, Eric Krebs, Jeremy Kientz, and Kelby Torgerson for their assistance with this study. Ammann AJ, Michel CJ, MacFarlane RB. The effects of surgically implanted acoustic transmitters on laboratory growth, survival and tag retention in hatchery yearling Chinook salmon. Environ Biol Fishes 2013; 96: 135-43. Anglea SM, Geist DR, Brown RS, Deters KA, McDonald RD. Effects of acoustic transmitters on swimming performance and predator avoidance of juvenile Chinook salmon. N Am J Fish Manage 2004; 24: 162-70. Panther JL, Brown RS, Gaulke GL, Deters KA, Woodley CM, Eppard MB. Influence of incision location on transmitter loss, healing, survival, growth, and suture retention of juvenile Chinook salmon. Trans Am Fish Soc 2011; 140: 1492-503. Cooke SJ, Woodley CM, Eppard MB, Brown RS, Nielsen JL. Advancing the surgical implantation of electronic tags in fish: a gap analysis and research agenda based on a review of trends in intracoelomic tagging effects studies. Rev Fish Biol Fish 2011; 21: 127-51. Adams NH, Rondorf DW, Evans SD, Kelly JE. Effects of surgically and gastrically implanted radio transmitters on growth and feeding behavior of juvenile Chinook salmon. Trans Am Fish Soc 1998; 127: 128-36. Brown RS, Geist DR, Deters KA, Grassell A. Effects of surgically implanted acoustic transmitters >2% of body mass on the swimming performance, survival and growth of juvenile sockeye and Chinook salmon. J Fish Biol 2006; 69: 1626-38. Moore A, Russell IC, Potter EC. The effects of intraperitoneally implanted dummy acoustic transmitters on the behavior and physiology of juvenile Atlantic salmon, Salmo salar. L. J Fish Biol 1990; 37: 713-21. Robertson MJ, Scruton DA, Brown JA. Effects of surgically implanted transmitters on swimming performance, food consumption and growth of wild Atlantic salmon parr. J Fish Biol 2003; 62: 673-8. Lacroix GL, Knox D, McCurdy P. Effects of implanted dummy acoustic transmitters on juvenile Atlantic salmon. Trans Am Fish Soc 2004; 133: 211-20. Piper RG, McElwain IB, Orme LE, McCraren JP, Fowler LG, Leonard JR. Fish hatchery management. US Fish Wildlife Service 1982. Hikasa Y, Takase K, Ogasawara T, Ogasawara S. Anesthesia and recovery with tricaine methanesulfonate, eugenol and thiopental sodium in the carp, Cyprinus carpio. Nippon Juigaku Zasshi 1986; 48(2): 341-51. Deters KA, Brown RS, Carter KM, Boyd JW, Eppard MB, Seaburg AG. Performance assessment of suture type, water temperature, and surgeon skill in juvenile Chinook salmon surgically implanted with acoustic transmitters. Trans Am Fish Soc 2010; 139: 888-99. Winter J. Fisheries techniques. 2nd ed. American Fisheries Society 1996; pp. 555-90. Brown RS, Harnish RA, Carter KM, Boyd JW, Deters KA, Eppard MB. An evaluation of the maximum tag burden for implantation of acoustic transmitters in juvenile Chinook salmon. N Am J Fish Manage 2010; 30: 499-505. Hall JE, Chamberlin J, Kagley AN, Greene C, Fresh KL. Effects of gastric and surgical insertions of dummy ultrasonic transmitters on juvenile Chinook salmon in seawater. Trans Am Fish Soc 2009; 138: 52-7. Chittenden CM, Butterworth KG, Cubitt KF, et al. Maximum tag to body size ratios for an endangered coho salmon (O. kisutch) stock based on physiology and performance. Environ Biol Fishes 2009; 84: 129-40. Jepsen N, Koed A, Thorstad EB, Baras E. Surgical implantation of telemetry trasnmitters in fish: how much have we learned? Hydrobiologia 2002; 483: 239-48. Knight BC, Lasee BA. Effects of implanted transmitters on adult bluegills at two temperatures. Trans Am Fish Soc 1996; 125: 440-9. Welch DW, Batten SD, Ward BR. Growth, survival, and tag retention of steelhead trout (O. mykiss) surgically implanted with dummy acoustic tags. Hydrobiologia 2007; 582: 289-99. Chisholm IM, Hubert WA. Expulsion of dummy transmitters by rainbow trout. Trans Am Fish Soc 1985; 114: 766-7. Sandstrom PT, Ammann AJ, Michel C, et al. Growth, survival, and tag retention of steelhead trout (Oncorhynchus mykiss) and its application to survival estimates. Environ Biol Fishes 2013; 96: 145-64. Wiens GD, Marancik DP, Zwollo P, Kaattari SL. Reduction of rainbow trout spleen size by splenectomy does not alter resistance against bacterial cold water disease. Dev Comp Immunol 2015; 49(1): 31-7. Hisar O, Yanki T, Hisar SA. Clinical and pathological investigation of Psychrobacter immobilis infection in rainbow trout (Oncorhynchus mykiss, Walbaum). Israeli J Aquac - Bamidgeh 2002; 54: 189-96. Shimma Y, Shimnia H, Ikedo K. Plasma constiuents of 2-year-old rainbow trout raised with fish meal and SCP combined feeds. Bull Natl Res Inst Aquacult 1982; 3: 61-73. Uyan O, Aral O, Harmantepe F B, Uyan S, Erdem M. Effect of raw anchovy as wet feed on growth performances and production cost of rainbow trout (Oncorhynchus mykiss) during winter season in the Black Sea. J Fish Sciencescom 2007; 1: 104-10. Walker LM, Parker TM, Barnes ME. Full and partial overhead tank cover improves Rainbow Trout rearing performance. N Am J Aquaculture 2016; 78: 20-4. Parker TM, Barnes ME. Effects of different water velocities on the hatchery rearing performance and recovery from transportation of Rainbow Trout fed two different rations. Trans Am Fish Soc 2015; 144: 882-90. Sharifuzzaman SM, Al-Harbi AH, Austin B. Characteristics of growth, digestive system functionality, and stress factors of rainbow trout fed probiotics Kocuria SM1 and Rhodococcus SM2. Aquaculture 2014; 418-419: 55-61. Barnes ME, Brown ML, Bruce TJ, Neiger R, Sindelar S. Effects of a fermented soybean meal diet on rainbow trout mortality and immune function during a disease outbreak. J Aquacult Feed Sci Nutr 2015; 7: 6-15. Wiens GD, Vallejo RL, Leeds TD, et al. Assessment of genetic correlation between bacterial cold water disease resistance and spleen index in a domesticated population of rainbow trout: identification of QTL on chromosome Omy19. PLoS One 2013; 8(10): e75749. Oguri M. On the liver tissue of freshwater stingrays and balloonfish. Bull Jpn Soc Sci Fish 1985; 51: 717-20. Jobling M, Koskela J, Savolainen R. Influence of dietary fat level and increased adiposity on growth and fat deposition in Rainbow Trout, Oncorhynchus mykiss (Walbaum). Aquacult Res 1998; 29: 601-7. Company R, Calduch-Giner JA, Kaushik S, Perez-Sanchez J. Growth performance and adiposity in Gilthead Sea Bream (Sparus aurata): risks and benefits of high energy diets. Aquaculture 1999; 171: 279-92. Yildiz M. The study of fillet quality and growth performance of Rainbow Trout (Oncorhynchus mykiss) fed with diets containing different amounts of vitamin E. Turkish J Fish Aquatic Sci 2004; 4: 81-6. Hung SS, Groff JM, Lutes PB, Finn-Aikens FK. Hepatic and intestinal histology of juvenile white sturgeon fed different carbohydrates. Aquaculture 1990; 87: 349-60. Sloof W, Van Kreijl C, Baars A. Relative liver weights and xenobiotic-metabolizing enzymes of fish from polluted surface waters in the Netherlands. Aquat Toxicol 1983; 4: 1-14.